The Humanitarian Service Medal has been authorized by the Joint Staff to be awarded to service members who were part of relief efforts after Hurricanes Harvey, Irma, and Maria struck the United States and Caribbean in 2017. Each branch of the U.S. armed services is to determine its own set of requirements for who qualifies for the award, according to the Department of Defense. 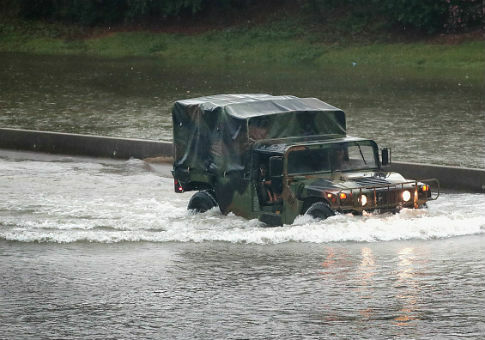 Members of the military are often called upon to respond in the wake of natural disasters, with one of the most notable cases in recent years being in response to Hurricane Katrina in 2005. In 2017, the military was called upon immediately as the storms struck. The award period and zone for Hurricane Harvey includes those who responded to one of 38 counties in Texas or a dozen parishes in Louisiana from Aug. 23 to Oct. 31. The eligibility for Hurricanes Irma and Maria goes from Sept. 8 to Oct. 20 and includes "the state of Florida and the Caribbean Sea and adjacent waters from Barbados northward to Anguilla, and then westward to the Florida Straits." This entry was posted in National Security and tagged Hurricane Harvey, Hurricane Irma, Military. Bookmark the permalink.